The Comnenus or Komnenos family was an important dynasty in the history of the Byzantine Empire. The Comneni originated in Paphlagonia, perhaps from the Kastamonu castle, which is possibly a corruption of Castra Comnenus. The Comnenus dynasty of Byzantine emperors was founded by Isaac I Comnenus, a Stratopedarch of the East under Michael VI. In 1057 Isaac led a coup against Michael and was proclaimed emperor. 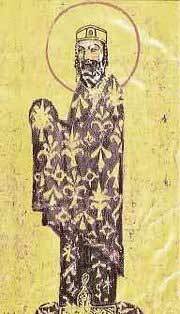 However, the dynasty did not come to full power until the accession of Alexius I Comnenus, Isaac I's nephew, in 1081. By this time, descendants of all the previous dynasties of Byzantium seem to have disappeared from the realm, such as the important Sclerus and Argyrus families. Descendants of those emperors lived abroad, having married into the royal families of Russia, France, Germany, Poland, and Hungary; thus it was easier for the Comnenus family to ascend to the throne. The Comneni were related to the Ducas family, whereby the clan often was referred as "Comnenoducai" (or "Komnenodukai") and both surnames were used together by several individuals. Alexius I married Irene Ducaina, the grand-niece of Constantine X Ducas, a general who had succeeded Isaac I in 1059. Several families descended from the Comnenoducai, such as Palaeologus, Angelus, Batatzes and Lascaris. Alexius and Irene's youngest daughter Theodora made the future success of the Angelus family by marrying into it: Theodora's grandsons were the emperors Isaac II Angelus and Alexius III Angelus. Under Alexius I and his successors the Empire was fairly prosperous and stable. Alexius moved the imperial palace to the Blachernae section of Constantinople. Much of Anatolia was recovered from the Seljuk Turks, who had captured it just prior to Alexius' reign. Alexius also saw the First Crusade pass through Byzantine territory, leading to the establishment of the Crusader states in the east. The Comnenus dynasty was very much involved in crusader affairs, and also intermarried with the reigning families of the Principality of Antioch and the Kingdom of Jerusalem - Theodora Comnena, niece of Manuel I Comnenus, married Baldwin III of Jerusalem, and Maria, grand-niece of Manuel, married Amalric I of Jerusalem. Remarkably, despite the general tendency for Byzantine emperors to be overthrown after a few years, Alexius ruled for 37, and his son John II ruled for 25, after uncovering a conspiracy against him by his sister, the chronicler Anna Comnena, and her husband Nicephorus Bryennius. John's son Manuel ruled for another 37 years. The Comnenus dynasty produced a number of branches. As imperial succession was not in a determined order but rather depended on personal power and the wishes of one's predecessor, within a few generations several relatives were able to present themselves as claimants. After Manuel I's reign the Comnenus dynasty fell into conspiracies and plots like many of their ancestors (and the various contenders within the family sought power and often succeeded in overthrowing the preceding kinsman); Alexius II, the first Comnenus to ascend as a minor, ruled for three years and his conqueror and successor Andronicus I ruled for two, overthrown by the Angelus family under Isaac II who was dethroned and blinded by his own brother Alexius III. The Angeli were overthrown during the Fourth Crusade in 1204, by a relative from the Ducas family. After the collapse of the empire in 1204, a branch of the Comneni fled back to their homeland in Paphlagonia, and set up the Empire of Trebizond on the Black Sea. The first emperor, also named Alexius I, was the grandson of Andronicus I. These emperors, the "Grand Comneni" (Megas Komnenos) as they were known, ruled in Trebizond for over 250 years, until David Comnenus was defeated and executed by the Ottoman sultan Mehmed II. A prince of the Komnenus family, great-grandson of Alexius I, Michael Angelos Komnenos Ducas (Michael I Ducas) founded in 1204 the Despotate of Epirus, following the dissolution of the Byzantine Empire after the Fourth Crusade. A renegade member of the Comnenus family, also named Isaac, established a separate "empire" on Cyprus in the 12th century. The island was taken from him by Richard I of England during the Third Crusade. The Byzantine Empire was restored in 1261 at Constantinople by the Palaeologus dynasty, a descendant family of the Comneni, and it ruled until the Fall of Constantinople in 1453.